Unglued | Lysa TerKeurst Gain a deep sense of calm by responding to situations out of your control without acting out of control with my book Unglued. You can get your copy here. Today I’m giving away 5 copies of Unglued! Leave a comment below telling me one way you’ll choose to take the high road this week. I was talking with a customer service agent from an online company I have enjoyed doing business with for years. I was in a hurry to check things off my growing to-do list and called thinking she could help me with a return. But when I explained I needed to return this certain item, our conversation started to head south. She informed me that my item wasn’t on the returnable list. It was on the final sale list. I had no clue there was a returnable list and a final sale list. It wasn’t posted online or stated in their catalog. And my tone of voice made it clear just how frustrated I was. Honestly, I didn’t have the time or patience to deal with this hiccup in my day. Later that same day, I was in line at the grocery store behind a man who wanted to use an expired coupon. The check out gal calmly stated she couldn’t honor his coupon. Well, he didn’t like that one bit. And he made sure everyone around them knew how much he didn’t like this situation. I stood back appalled at his actions. I’m sharing more on what I learned about having better reactions in dealing with daily frustrations over at (in)courage today. Click here to read the rest of my post. My heart raced as I saw the number pop up on my phone. Nothing in me wanted to have this conversation. I was beyond aggravated. Hurt. Angry. And tired of being misunderstood. I answered the call with two goals in mind – to prove how right I was and how wrong they were. This conflict happened over 5 years ago so the rush of emotion has dissipated and I can see more clearly how wrong my approach was. I learned from that conflict. Hopefully, I learn something from every conflict – especially how to have better reactions. I’m so far from being in a place where I can shine my halo. While my initial thoughts when a conflict arises are usually those same old “I’ll show you” thoughts, I’ve progressed by not letting those leak into my reactions. 1. What part of this issue can I own and apologize for? There are always two sides to every issue. And no side is perfectly right or all the way wrong. 2. How can I soften my heart toward this person so I honor them despite how they react? Gosh, this one is hard. Really hard. But I know hurt people hurt people. Usually the person with whom I’m having a conflict has some kind of past or current hurt in their life feeding this issue. Chances are that hurt doesn’t have anything to do with me but is adding to their emotional response in this conflict. 3. If I knew this conversation was being video taped and then shown to people I greatly respect, how would this change my reaction? What if I showed up to church this week and my pastor directed everyone to watch the screen for an example of a bad reaction? And then my face appeared. Have. Mercy. I. Would. Surely. Faint. #Call911. I know every conflict has variables that must be considered. Some conflicts have escalated to the point where professionals must be called in to help. Be mindful and prayerful about this. But for the everyday conflicts we all have, these questions are good to consider. 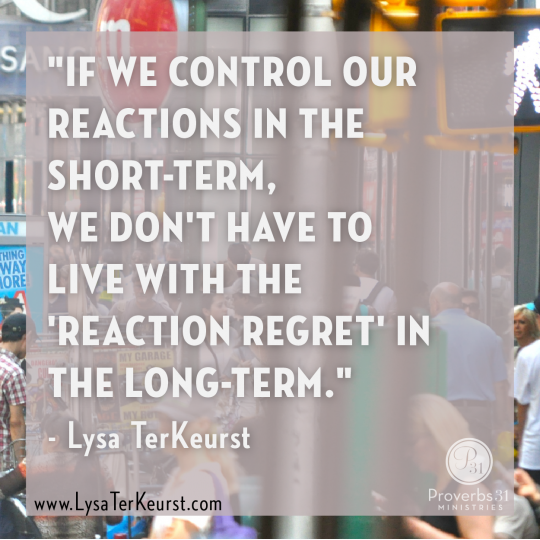 If we control our reactions in the short-term, we don’t have to live with ‘reaction regret’ in the long-term. If you found these 3 questions helpful, my book Unglued digs deeper into managing conflict in a godly way. Leave a comment telling me which question resonated with you the most and you’ll be entered to win 1 of 5 Unglued books I’m giving away today.